Enterprize Wharf is one of the two best places on the Yarra River to watch the Gas Brigades (AKA fireballs) that run daily from 8pm-9pm till midnight. From that place you can see them all with the Crown casino in the background. It's especially beautiful at sunset when the sky is not completely dark. It's also called Enterprize Landing and it is the birthplace of Melbourne, when on Sunday 30th August 1835, settlers on the tall ship schooner Enterprize docked on this spot, thereby 'founding' Melbourne. 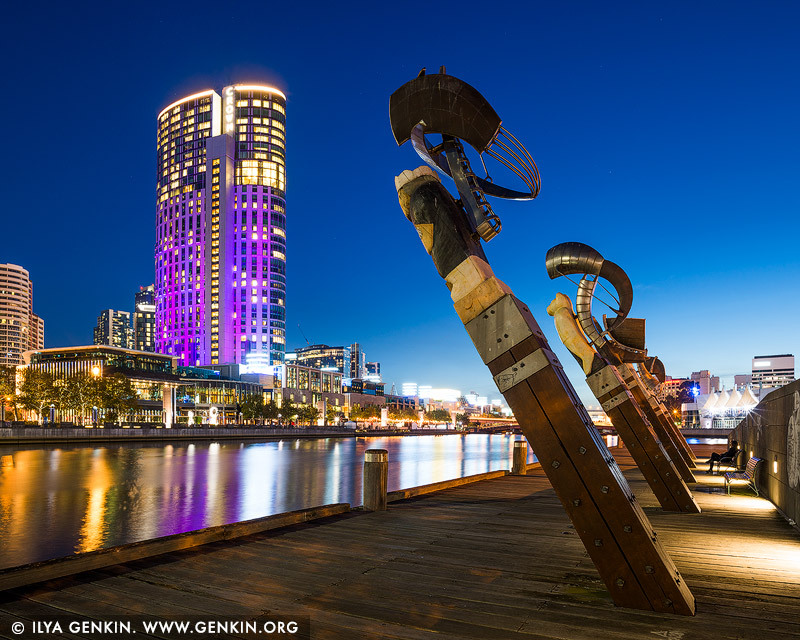 On the landing are 5 statue figures staring out across the Yarra River turning basin along with a plaque commemorating the landing. This image belongs to the travel and nature stock photo library. This stock photo of Crown Casino at Sunset is available for licensing for commercial and editorial uses including websites, blogs, books, magazines, brochures and advertising. Restrictions may apply for images which contain third party copyrighted material or sensitive subjects. Photos of artwork are for editorial use only. This image id AU-MELBOURNE-0014 of Crown Casino at Sunset, is copyrighted © by Ilya Genkin. This is not a public domain image.